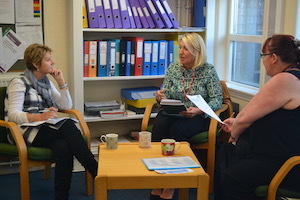 Our staff are currently working in partnership with teachers from Belle Vue Primary School on a programme of lesson study: planning, researching and studying how pupils learn best. In September 2014 we engaged in a joint research project with University of Cumbria to evaluate our approach to organising the curriculum and teaching. Through this project the whole teaching staff team have continued to mould and shape how we teach, testing and evaluating our practices to ensure that they are based on, or tested against sound, research evidence. "How does the LEEP project, through its focus on learner dispositions, help to create coherence between elements of classroom practice (including formative assessment, meta-cognition, collaboration and mastery learning) and lead to raised attainment and development of self-regulated learners?" The study has helped us to focus more on those teaching approaches which are proving most effective; it also helped us to evaluate the way we make everyday choices about what and how we teach different lessons. We are members of the Teacher Development Trust Network, a collaborative partnership of schools and colleges focused on innovation and improvement through highly effective and evidence-based staff professional development and learning. For further information visit the TDT website: tdtrust.org, or read our TDT case study. LEEP stands for "Learn, Enrich, Extend, Practise." It is an acronym created by our teachers to encapsulate the way we organise learning for approximately 35% of the school day. The pupils understand what it means - ask them to explain in their own words! This is a key feature of quality teaching. Put simply, it is identifying precisely what a pupil already knows and can do, and determining what they need to learn next. Good teachers do this continually to ensure pupils make rapid progress. We are one of 11 pioneer primary schools across the UK working with Empathy Lab and lots of authors and publishers involved in pioneering experimental approaches which harness the power of stories to build a central life skill for children � empathy. University or college students are required to be self-regulating. Put simply, self-regulated learning requires pupils to be organised, determined, driven and effective in their learning. If learners are self-regulating, they are equipped with strategies to help them make good progress because they know what they need to learn and how to go about learning it. Our research is underpinned by our professional experience and research evidence that when there is one teacher and up to 30 pupils, the combination of highly skilled teaching and pupils who are self-motivated and self-regulating will result in their progress being more rapid, their attainment being greater, and their learning going deeper.